It does not take an expert to find a moisture leak in a home if a dark, wet ceiling or wall stain (possibly accompanied by dripping or trickling water) is present and in clear view. What homeowners require professionals for is the detection of roof leaks which may be hidden or invisible to the naked eye. Many home inspectors have embraced infrared technology as a means to better locate these potential trouble spots in a home. What the Heck is Infrared? Infrared technology (also called thermal imaging) utilizes devices that can detect light on the infrared spectrum which is imperceptible to the human eye. Simply put, infrared light varies in direct correlation with the amount of heat exuded by a surface or object. Products like the FLIR E60, Fluke Ti400, or Keysight TrueIR imager help home inspectors locate leaks by observing infrared signatures of roofs or walls. Usually, these cameras are used in conjunction with moisture meters that can verify the presence of liquid in a given area. Infrared technology enables an inspector to identify the varying temperatures on a roof. During daytime hours, the sun heats up the roof surface; and the roof radiates the heat back into the air at night. However, areas where moisture is present do not cool as rapidly after being heated. Infrared devices can display these warmer areas on a screen, which can help pinpoint where moisture may be collecting within a roof’s underlayer or insulation. Moreover, infrared cameras can be used to spot problems besides moisture incursions or leaks. 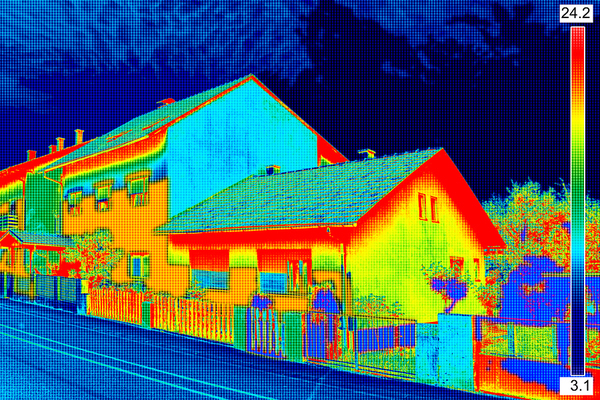 Observing differences in heat signatures can help home inspectors evaluate the energy efficiency of homes by highlighting areas where heat may be escaping. These devices can also detect various foundational, mechanical, or structural issues that could lead to costly problems if left unaddressed. Like any tool, infrared cameras are only effective when they are used properly and their data is interpreted accurately. For example, insulation with different absorption characteristics or R-values will give off different heat signatures; and if multiple types of insulation are present on the same roof, this could impact the accuracy of an infrared inspection. 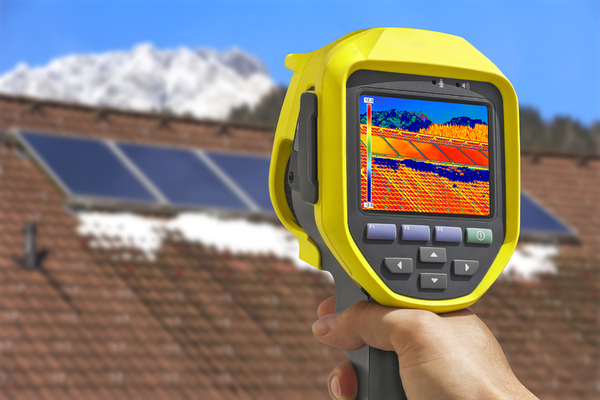 Also, materials such as vegetation, dirt, bitumen, gravel, or other debris lying on the roof can distort the results from an infrared camera. Since infrared devices measure heat, the amount of heat being calculated can be affected by wind, air exhaust, lights, steam pipes, or steam plumes on or near the roof. Educate yourself about the properties of the specific roof-covering of the home before conducting the inspection to ensure that your results will be untainted by false readings. Identify any areas of the roof that may have been repaired with material that is different from the original roof composition. Do not conduct the inspection when winds exceed 15 mph. Make sure that the roof is not wet from rain, dew, snowmelt, or other moisture. When possible, begin the infrared inspection around dusk when the temperature is beginning to drop significantly. This maximizes the odds of getting clear readings on your display. Encourage customers to add an infrared inspection to their annual home inspection checklist. If you believe that purchasing an infrared camera will boost your home inspection business, do your research to find the device which gives you the best value for your dollar. Hopefully, you will be able to make up the cost of the camera with additional revenue, all while providing another valuable service to your customers! Would you like another tool to make your home inspection work easier? Download the home inspection app for your iPhone today!